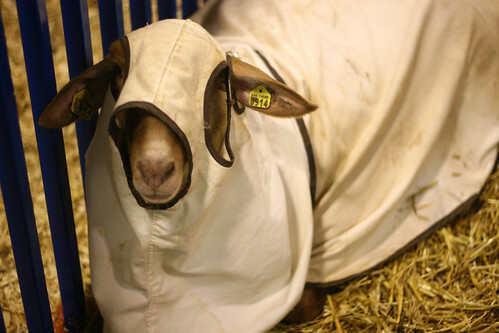 Will someone please tell me why this sheep (Forgive me, or is it a lamb? Nevermind, I just learned that a lamb is just a sheep under 12 months old!) is wearing a striped spandex suit??? I know there has to be a reason, and I’d feel much better knowing. 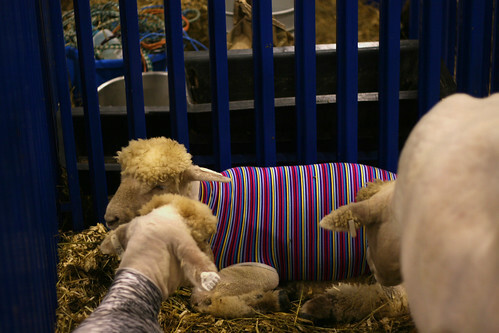 Okay, so I googled “why put spandex on a sheep” (My other word combinations didn’t generate any results.) and got to this … apparently it’s a lamb tube and it’s intended to keep them clean between showings? Is this correct? And is it the same principle for the goats? Why don’t they get the cool spandex tubes? And why do some of them wear hoods? I’d love to know – seriously! I wonder every year as we check out the animals at the fair and would love to know the answer.